Indicator Label warns of wheel heat. Attached to wheel/rim by self adhesives, HOT WHEEL Label features temperature-sensitive white arrow that changes and remains bright orange when temperature of wheel reaches 250Â°F, warning of overheated wheel condition. After wheel problem has been corrected, new decal must be installed. While HOT WHEEL will not indicate every instance of wheel end component malfunction, it will indicate excess temperature for prolonged periods that could decrease function or cause failure. ESCO announces its new HOT WHEEL: Wheel Heat Indicator Label which is designed to warn drivers, maintenance personnel, and safety inspectors of possible wheel end, bearing and brake failure during walk around inspections. The HOT WHEEL decal is attached to the wheel/rim by self adhesives. When the temperature of the wheel reaches 250°F the temperature sensitive white arrow changes and remains bright orange, warning of an overheated wheel condition. After the wheel problem has been corrected a new HOT WHEEL decal must be installed. While HOT WHEEL will not indicate every instance of a wheel end component malfunction, it will indicate excess temperature for prolonged periods that could cause decrease function or failure of wheel end components. CSA 2010 reminds drivers to complete pre and post trip inspections. 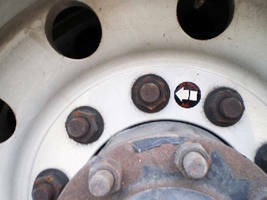 These inspections also provide the driver with an opportunity to visually inspect the conditions of the HOT WHEEL indicator label positioned between the wheel studs on the vehicle. See user instruction for installation and inspection. For More Information about the new HOT WHEEL from ESCO or to request a sample of the product please call 1-800-352-1117 or send your requests to sales@esco.net.